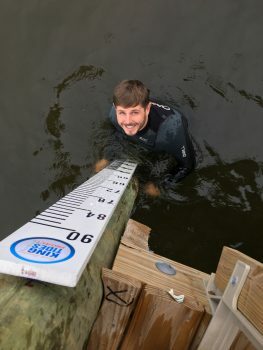 On a relatively calm January day, Michael Flynn, coastal advocate for the Wanchese office of the North Carolina Coastal Federation, donned his wetsuit to install a king tides gauge at the end of the office dock. The King Tides Project is an international citizen science program used to document extreme high tide events using photos and data collection. Tracking these extreme events around the world helps communities see what their shoreline looks like today and visualize what it could look like in the future with continued sea level rise and nuisance flood events. North Carolina is of particular interest in this project due to its extensive coastline and its unique exposure to tides, heavy rain events and wind effects. The King Tides Project is specifically focused on documenting the frequency and intensity of king tide events, which are the lowest and highest tide events of the year. They are predictable events that occur when the sun, Earth, and moon are in alignment and the moon is at its closest point to the Earth. These conditions can cause extreme highs and extreme lows due to the increased gravitational pull of all three celestial bodies. The project aims to document daily tidal events as well. In order to do that, easy-to-read gauges are installed in public locations, at the end of piers and docks, where photographs can be taken to easily compare water level conditions on a day-to-day basis. 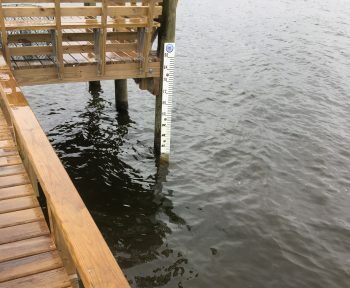 The federation’s Wanchese office installed recently their gauge and will use it to monitor water levels in Broad Creek every workday. This monitoring goes hand-in-hand with other daily environmental monitoring that the office records, including water temperature, salinity, oxygen levels and local weather patterns. Visitors to the office can participate in the King Tides Project and help with these monitoring efforts. Simply visit the project’s Water Level Reporter form and submit your observations. On that page you can also see past observations for this location by clicking on the google map locator for the Wanchese office. For more information on about the King Tides Project, click here.